This round setting is a classic design for holding a faceted stone. The bottom of the setting is open. This reduces weight and allows light to hit the bottom of the stone if your design permits. 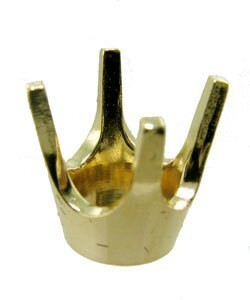 The prongs feature "TruSeat" design. Pre-cut seat provides a starting place for the stone setting process to help ensure level setting. The prongs are thick enough for a seat to be cut in the interior. Once the stone is in place, the prongs are pushed inward and burnished over the girdle of the stone to hold in securely in place. Though this head is precision die struck, finishing will need to be done after the stone is set.